On Christmas Day 1914, at the height of World War I, British and German soldiers heard the guns fall silent, and slowly began climbing over the trenches. Spontaneously, an unofficial truce emerged. For a few short hours both sides celebrated Christmas, exchanged gifts, drank hot chocolate, and played football together. What causes people to trust one another, as the soldiers did that Christmas? According to the 2014 World Values Survey, only 3.4 per cent of people in TT agreed that others could be trusted (compared to more than 60 per cent in Scandinavia). Workers don’t trust employers to make investments in them and include them in the of benefits of growth. Employers don’t trust workers to get the job done, or act in the best interests of the firm. Suspicion, fear and lack of trust become self-fulfilling, leading to exactly the behaviour they predict. This leads to constant, exhausting battles as each side tries to extract as much as possible out of the other while giving as little as possible in return. One of the ways this manifests itself is a need for total control. Managers end up micro-managing. Most people fundamentally desire autonomy – so this naturally leads to resentment. Employers will only increase wages if they trust that their workers’ productivity will increase. A lack of trust and systems of verification prevent people from bringing on new staff or freeing up time to focus on growth. If people trust each other, they are more likely to invest, work together and grow. As Nobel-prize-winning economist Kenneth Arrow put it: “Virtually every commercial transaction has within itself an element of trust." There is strong and sometimes dramatic correlation between trust and GDP per capita, even after controlling for other variables. If African countries had the same level of trust as Sweden, income per capita in the year 2000 would have increased by 546 per cent. As trust increases, the costs of monitoring workers fall, so firms can hire more. And students can gain easier access to knowledge, advice and intangible support from more trusting mentors, friends or colleagues. A more trusting and trustworthy electorate also demands better governance from its politicians and bureaucrats, and supplies more trustworthy candidates for those positions. If people trust that plans will be executed, they are more willing to pool and take risks. Banks gain more comfort that borrowers’ projected financial performance will actually be achieved, whilst businesses gain comfort that they can access financing during hard times. Trust allows people to partner and raise more capital than they could have on their own. Of course, blind trust can be dangerous or risky. The Russian proverb comes to mind: "Trust, but verify." The question isn’t necessarily "How can we trust more?" Instead it is: "How can we be more trustworthy?" Trust theorist Rachel Botsman cites academic Diego Gambetta, who describes the two enemies of trust: bad character and poor information. To be trustworthy, Botsman notes that we must be as upfront as possible about our intentions and motives, displaying what she calls "integrity and benevolence." As a former boss used to remind me, just saying, "Trust me," is the surest way to make someone do the opposite. It helps to start with a clear and upfront exchange. Offer to help to generate more business, in exchange for future benefits, even if you don’t trust that your efforts will be rewarded. Offer incentives tied to numbers and goals. We can test the waters with smaller risks. Trust is built through a gradual series of exchanges. This is especially true when things go south. Handled right, difficult situations generate the most trust. Openly owning a problem or mistake builds significant trust – even if it is embarrassing or creates trouble for you in the short term. It is not enough to just establish integrity. We must then demonstrate competence and reliability. So much of trust depends on whether people do what they promise. This is where technology can help. The innovations that underpin the sharing economy (in which individuals directly exchange assets or services) are really about trust. Platforms like Uber, Airbnb or Alibaba enable the easy sharing of verifiable information (particularly on reliability and quality). They allow for ratings, quick communication and dispute resolution within a clear incentive framework. Technology cannot make people trustworthy – but it can make them accountable. Trusting more and earning the trust of others won’t just make us happier, safer, and more loving. It won’t just knit society closer. It is in our own self-interest. 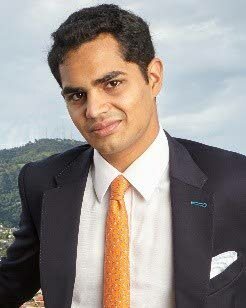 Kiran Mathur Mohammed is a social entrepreneur, economist and businessman. He is a former banker, and a graduate of the University of Edinburgh. Reply to "Trust to Growth"